Are clients financially ready for a long retirement? Will you live to be 100? While no one can predict the future, longevity is an important consideration when planning for retirement. 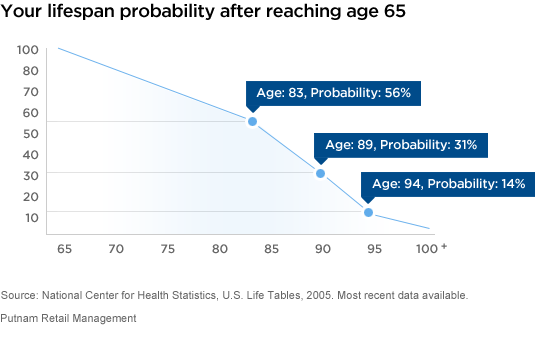 A longer life could extend retirement years, and issues like inflation, health-care costs, and withdrawal rates may become increasingly important issues to navigate. To meet retirement income goals, clients will want to understand the impact of longevity on asset allocation. To get an idea of what retirement may be like, some people use calculators, like Living to 100,created by the director of the New England Centenarian Study at Boston University. The calculator provides a personal estimate after you complete a questionnaire about lifestyle habits. The Social Security Administration also offers a calculator that helps people gauge how many years they may have in retirement after they start collecting benefits. Still others may point to the Centers for Disease Control (CDC), which recently published its longevity estimates. The report offers a healthy life expectancy projection, which combines mortality with health status data to estimate how many years of good health may be ahead. Geography also plays a role. The CDC found that 65-year-old individuals may have another 21 years of good health if they live in Hawaii, or may expect a shorter retirement in Mississippi, with only 17-1/2 years beyond age 65. The fact is that both men and women are living longer in general and women continue to outlive men. In 2011, the life expectancyfor men was 76.3 and 81.1 for women, up from 75.7 for men and 80.6 for women in 2009, a record-setting year according the CDC. Between 2000 and 2010, life expectancy at birth increased 2.1 years for males and 1.7 years for females. Living to 100 is possible. The Census reported that the number of centenarians grew 65.8% from 1980 to 2010, and totaled more than 53,000 individuals. Yet many clients may not incorporate this information in their retirement planning and may underestimate what they need to save to generate income in retirement. Whatever the data source, starting a discussion about longevity may help clients consider the possibilities of a lengthy retirement and understand the need to optimize a range of strategies to generate sufficient retirement income.